I haven’t had any trouble with my uberti’s. They have good fit and finish. They are not ruger blackhawks, so no high pressure loads. The main drawback for me is, they don’t make many guns with adjustable rear sights. I had a well used when I got it Uberti Cattleman that shot just fine and seemed well put together. I now have a Taylor Uberti Cattleman that I've put maybe 50 rounds thru it without a problem. Fit and finish on the new one seems just shy of perfect. I would try to regulate the load to shoot to the sights. The standard bullet is usually 255gn. I bet that and 7.5-8.0 of unique will put you real close. Another trick that I am about to attempt, is to file serrations on the back of the front sight. Then I will mark with white fingernail polish where I want the top of the sight to be. yea u may be right. I love 'em. Just simply love 'em! Let me see...1,2,3....5....8 -- that's all I can think of at the moment, but there could be a couple more. In my often-disputed opinion, the Uberti revolvers made today are the equal of the Colts. If I didn't like them, and didn't like the quality and workmanship I'd quit buying them, and obviously that hasn't happened. Wheelguns 1961 is right on with his load of 8.0 gr. of Unique and a 255 gr. cast lead boolit for the .45 Colt, and I don't think anyone considers that a "cream puff" load. It's just a nice, all around just right load. Personally, and I realize "to each his own" holds true here, but the birds head grips/frames have never appealed to me. Give me the original plow handle. Don't overlook the .44-40 ca'tridge, pardnah, a bit more challenge to reload but very authentic. Pretty soon you'll want a compatible lever action carbine to go with your hog leg. Except for the fact that the Ubertis are great guns I just have one piece of advice for you, which is to not overlook the Pietta-made guns. Used to be they were a step below Uberti, but they're pretty much up to snuff now and usually a bit cheaper. I have 3 Uberti's. 1 marketed by Stoeger in 45 Colt. 1 marketed by Cimarron in 44 Special and a Uberti in 32-20. All 3 are the same frame size, I know because the cylinders will interchange as far as being inserted and the center pin going home. The one thing that puzzles me it the fact that the grip frames are 3 different sizes. All are plow handle style just as the Colt is. The 45 is 5/8" short as compared to the Cimarron and the 32-20 is 3/8" short of the Cimarron. Good guns, I bought them all used. The front sight on the 32-20 has been filed down. I love em. Great guns! Most of them will benefit from a Wolff reduced power hammer spring, but they are fun just as is. I've got a Uberti Russian Model No.3 (Schofield variant) replica in .45LC . It is a very nice revolver. Fit and finish are both good. I've only got a couple hundred rounds through it, so far, but it hasn't had any hiccups and works well. I don't particularly like the front sight, but it is a replica of an actual gun so I'll deal with the sights the same way the Russian cavalry had to. I got it used and felt it was a good deal. 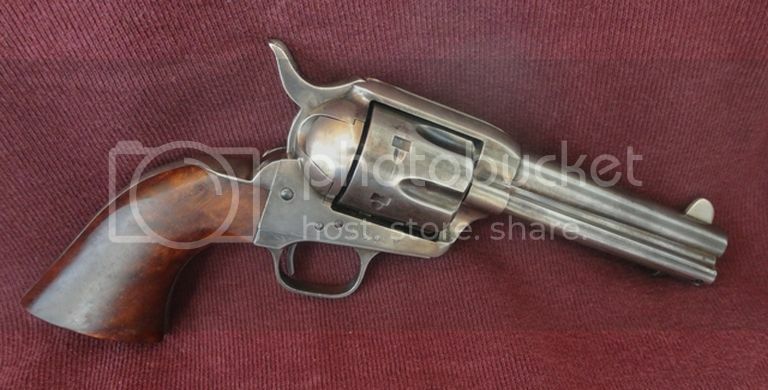 It is definitely one of the coolest looking revolvers out there with some interesting history behind it. I bought one of the " Evil Roy" models in 45 Colt a few years back. Great revolver. Fit and finish are very nice. Shoots great. I did replace the cylinder pin with one of the Belt Mountain pins. It does function easier. The original pin worked as it was supposed to, but the Belt Mountain pin works better. I loads 9 grains of Herco under either a 255 or 260 grain cast . Shoots to POA. i would consider something in a 44-40 but i must not be seeing them on the Uberti web page. I have the Uberti "Old West" model, I think they only made these in 2004 or 2006, they told me they used a process that uses cyanide to achieve the aged finish. This one has .4565" throats and a .451" barrel so I size .456" for a snug fit in the throats, over 9.0gr Herco for an accurate 900-ish fps load that shoots to the sights using the 454190 boolit with SPG in the lube grooves. Some folks think making an aged or replica or distressed finish is a total waste but I owned a genuine 1902 Colt SAA 4 3/4" barrel, 45 Colt, with no bluing, action tight as a new drum, and I gotta say, the distressed finish on the Uberti is UNBELIEVABLY CLOSE to the real deal 100+yr old Colt, I could kick myself hard for letting that old Colt get away, it had Cowboy history behind it from Wyoming in 1910, carried by a member of the posse, this gun had provenance, it was just a nice old Colt, sharp internals, and the Uberti fills that void, it didn't bring the old Colt back, but it sure filled the vacancy!! Last edited by DougGuy; 02-10-2019 at 11:01 PM. Check Gunbroker. They have lots of them. Buds as well. I have a few in 44-40 and they are pretty sweet. I had an 1875 Remington Uberti 5-1/2" that was the most accurate .45 Colt revolver I've ever fired. That includes S&W m25, Ruger, and Colt 1909 and SAA as well as other Italian copies. I should have kept it but the CAS shooter I bought it from HAD to have it back. It was nickel plated- I called it Doc. I have a total of six Uberti revolvers - as far as cartridge, I have a .357 Bisley, a '51 Navy R and M conversion (38 special) and a .45 SAA Cattleman. All are good solid revolvers, well made, function well and shoot great. The 45 Cattleman I have is a 7 1/2 barrel - very accurate with both BP and smokeless - have never had a problem with any of them. So how about the 1873 Cattleman II has some kind of firing pin safety , how is it ? I have at least 6, plus a 1875 Remington Clone & a S&W #3 Schofield clone. Have .45Colt, .44WCF, .44Spl & .357Mag. As far as the grip size difference, you have to remember that the Revolvers are built according to the Importers specifications. As a for instance, in the 1990's, the Importer; EMF had a Hartford model that was built close as practical to a 1st Gen Colt. Many parts would interchange with a Colt. And then a Dakota model, built cheaper. It used a smaller grip frame made entirely of brass. Fit and finish were not as good. And the Dakota sold for $100 less then the Hartford. Never had a problem with any Uberti, I own 5 Rifles too. But I HATE the so called "competition sights". That big fat front sight ruins the sight picture, too little light on either side. I bought a new break top, out of the box it had issues. Zero reply from several emails to Uberti, fixed it myself. 100rds later the timing was going out. Got rid of it, really neat gun, but not worth the money they charge.